Planning, preparing and practicing for an offshore sailing adventure encompasses a project that is not for the faint of heart, but sailors are usually people with a high level of tolerance for uncertainty. The overall project is composed of multiple tasks, most of which are intended to prepare the boat and its crew for every eventuality. But, the sea is predictable only in that it is largely unpredictable at any given time, so the task set is intended to mitigate risk and reduce uncertainty through thorough preparation and practice. It is often said that there is no place for wishful thinking on a boat, meaning that sound, thorough preparation and good maintenance are essential. Decision making at every step of task implementation becomes critical and is, more often than not, subjective. So how long does it take to plan, prepare and practice what can go wrong along the way? How important are contingency plans? It depends. Planning and execution can be parallel processes for much of the time. Starting with buying the right boat or upgrading an already mostly suitable boat, the prudent sailor can prepare the boat and themselves by adding equipment and gaining skills and knowledge to safely and successfully execute an offshore passage. We started by looking for and buying a suitable boat, and then spent a lot of time and money preparing it and ourselves to go offshore. We added all the stuff that has become important, but the list of “essential” items will differ from person to person, depending on how they measure, monitor and mitigate risk. We replaced all the rigging, added radar, AIS, SSB, a water-maker and beefed up several critical structures like the mast step and skeg, which were a bit light on our French-built boat. New sails, an inner forestay, running back stays, end of boom gybe preventer, etc., were added as time and money allowed. Taking part in VICE more than 12 years ago helped us learn many important things, most notably that the boat is never ready, but needs to be ready enough to provide confidence to the captain and crew. Self-steering of some kind is essential and there is never enough electrical power, so power management strategies are essential. We added solar panels, a wind generator and both an autopilot and a windvane. Marathon, our Beneteau Idylle 1150, sailed from Vancouver, BC to La Paz, Mexico in 2009 with three experienced sailors on board, There were some hard days off the coast of Northern California and one of the “To Do” jobs that didn’t get done prior to departure became an issue when nine meter waves broke over the boat. 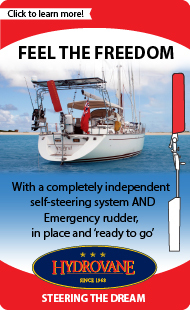 A fundamental principle of yachting and boat management is “keep the water out”. Not sealing the dorades allowed large quantities of water to drench the inside electronics, including the SSB, Pactor modem, AIS and VHF. So now we have plugs for the Dorades. Onward sailing plans were delayed when some interesting jobs (aka “work”) intervened for about seven years, including three years in New Zealand, which was to be at least the penultimate destination of our offshore voyage. So a departure date to cross the Pacific to French Polynesia was set for March 2016, by which time work would be over and done with. Routes were researched, charts (paper and electronic) were purchased, gear and systems were refurbished, repaired and replaced. Buddy boats were found and more detailed plans were made. But as often happens, even with good plans, an obstacle emerged. A “moral” obligation to see through a project for the captain’s employer got in the way and departure was delayed until March 2017. This was not entirely bad. More employment generated money, which meant more equipment could be purchased (a water-maker for example). Also, there were emerging indications that 2016 was going to become an El Niño year, and it did. Some boats departing for the Marquesas that year did a lot of upwind sailing. 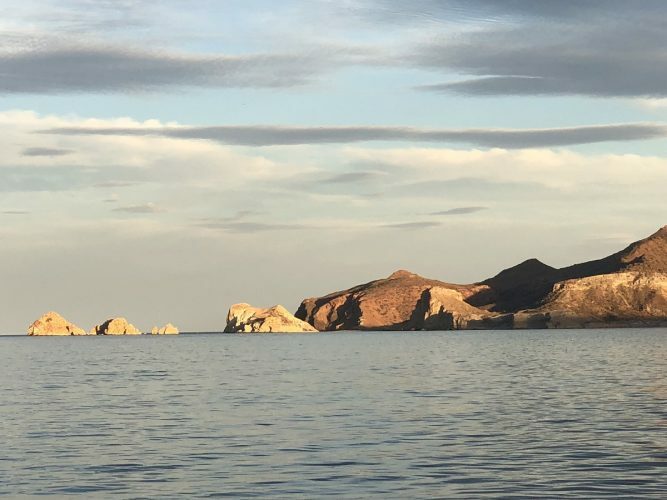 And sailing in the Sea of Cortez is actually quite nice, so another year in the Sea was a kind of blessing. Remembering that the boat is never ready, we planned to return to La Paz in November 2016 to keep working on the boat and keep strengthening our sailing skills. A family illness, however, kept us in BC until mid-January 2017 and by mid-February we decided that we would not be ready enough to leave in March. So more sailing in the Sea and more time with family, particularly grand kids in Canada, was scheduled and enjoyed. November and December 2017 were spent fixing boat things and testing systems, including provisioning. The objective was to have about eight weeks of tasty and enjoyable food on board that would see us through a four to five week passage from Mexico to the Marquesas. Provisioning opportunities in La Paz and the addition of a small freezer made these requirements highly possible. Everything seemed to be in place when we returned to Vancouver for Christmas 2017 for a visit with family and friends and the purchase of a few more small items to add to the boat. Returning to La Paz in mid-January 2018, serious provisioning started. The new freezer was being filled and parts of the bilge that had not recently seen the light of day were being filled with food and drink that could survive an ocean passage. The captain created a Gantt chart, with a notional departure date of mid-March. All repairs and new equipment (e.g. a beefier anchor roller, additional USB charging ports at the helm and in the cabin, an IridiumGo with an outside antenna) would be installed prior to that date. Some minor engine repairs were underway, but no show-stoppers were identified and all projects were being ticked as “complete” on the Gantt chart in a very timely way. A small group of “Jumpers” had been identified in our Marina, in addition to some others who planned to leave from La Paz rather than the Mexican mainland. We met weekly and discussed routes, gear, weather, and other topics that are relevant but not 100% defined given the large range of options, preferences and strategies possible in offshore sailing. We created and operationalized our own little SSB net and when the first of our group left on March 3rd, we kept in touch with that boat and each other via the net. We alerted our weather router (and insurance company) that we intended to leave on 21 March, if the weather looked to be suitable to let us sail to Cabo San Lucas for final fuel, provisions and possibly repairs. We made arrangements with a local agent who would facilitate the Mexican check out process and save us two days of time going to multiple government offices to acquire the departure document termed, zarpe, which might be required at our next port of call. Earlier, in 2017 we had arranged for a friend to join us as a third crew member. Sailing from Vancouver to La Paz with three crew on board had worked well and we planned to replicate that environment on the way to French Polynesia. Three crew on board makes four hour watches with eight hours off possible, which in turn allows for enhanced rest and improved redundancy in the event that somebody is incapacitated for any reason. The downside of three crew is space and food, but we saw this as insignificant compared to the upside. Our crew member arrived in Cabo at about 1330h on 12 March. Everything had fallen into place, we were ready to go. Then, that same day, the first mate tripped and fell on the dock at about 1400h, breaking her left knee cap into multiple pieces and fracturing a bone in her right arm. Within a few hours of falling, we learned from an orthopedic surgeon that post surgery, her knee would be immobilized for at least 6 weeks. Winching her back on the boat and dropping her through a hatch was not advised and we decided to return to Vancouver for the required surgery. DAN Boater did a terrific job of organizing an evacuation and paid for 3 seats on the flight home for her and one for the captain. During this time, from the fall until meeting the surgeon in Vancouver, we believed that the first mate could meet us in the Marquesas, if we could find a new third crew member or if we were prepared to make the passage with a crew of two. 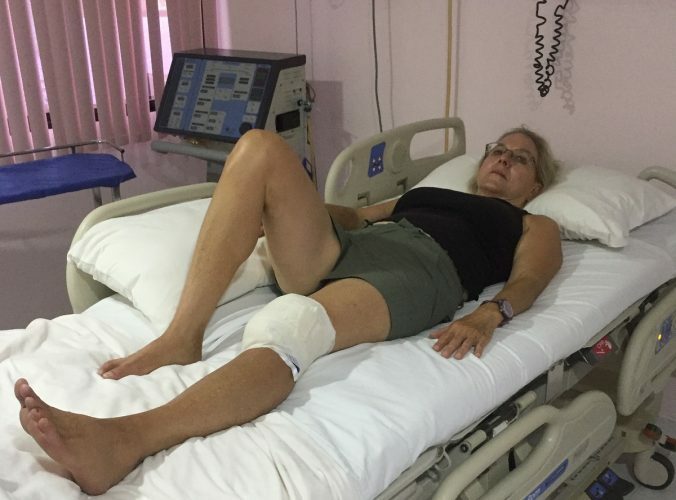 The surgeon in Vancouver, despite not being a sailor, assured us that it would be four to six months before the first mate’s knee would allow her back on a boat. We did not have long stay visas for French Polynesia, and had planned to leave the boat in Tahiti in July until March 2019. She would miss everything. Meanwhile, our friend and third crew member was waiting patiently in La Paz for a decision regarding next steps. Several weeks of discussion towards a tough decision ensued. The captain is a scientist and objectivity tends to rule in that domain. However, sailing is fraught with subjective dimensions that cannot be ignored, and can be difficult or impossible to quantify. The emotions associated with a first big crossing are significant and had weighed on us for several years because of the previous two delays. Further, our friend, the third crew member, had set aside several months of time to be a part of our big voyage. Feelings and emotions around the go/no go decision were abundant and complex. At anchor and resting nicely after many hard decisions. The financial implications were also important. We had purchased air tickets to get us home from Tahiti, as had our crew. Our crew’s wife had a return air ticket to facilitate meeting us in the Marquesas. The probability of getting full or partial refunds was unclear, but early indications were not positive. Staying in La Paz would mean another $10,000 in marina fees and another hurricane season. Finding a new third crew member on such short notice was not possible among people we knew and had confidence in. Though we probably could have, we chose not to take a chance on introducing someone new and unknown to all of us as a replacement for the first mate. So the safety and security issues that had been previously mitigated by adding a third crew member became issues again. Next, the boat had a lot of food and other supplies on board that had “best before” dates on them. The medical chest contained some of the most important and time sensitive of these items, and had required significant time and effort to accumulate. And then there was the angst associated with months, if not years, of really hard work to prepare ourselves and the boat, which after two previous postponements, was especially acute and front of mind. The first mate had worked very hard to prepare herself and the boat for the voyage. Not participating in the crossing would be a huge disappointment. The clock was ticking. Departure windows for the planned voyage are reasonably large, but not infinite. There is usually a “least worst time” to go and the weather patterns that were starting to emerge north of the ITCZ were not good and there was a risk that the SE trades south of the equator would begin to dissipate. All of the La Paz Jumpers had left and it was hard to help each of them cast off their dock lines, at least partially because they all encouraged us to go anyway. Everybody on our dock was familiar with our dilemma and asked, “So?” pretty much daily. The third crew member and I also discussed Plans A, B, C and so on, every morning, weighing carefully the impact of a decision on a range of multiple people. So this article is being written in Caleta San Juanico, a fantastic anchorage in the Sea of Cortez. The crew and I without the first mate decided to do a 30 day shake-down cruise, testing systems, ourselves and eating an enormous amount of food stored in the freezer and every other nook and cranny in the boat. We will have an extra season in the Sea this year, prior to leaving for the Marquesas in March 2019. The third time could have been the charm, but sometimes life isn’t like that, particularly if a boat is involved. 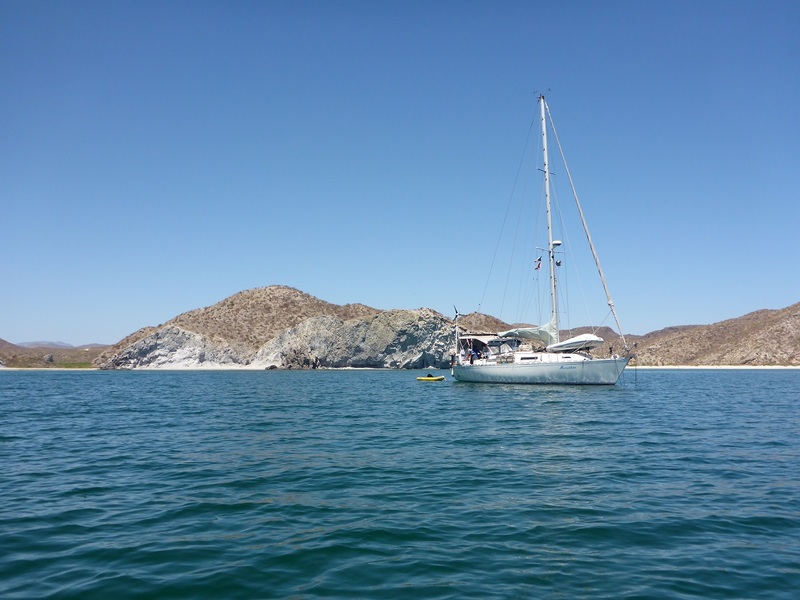 Nello and Sheridan have been sailing for more than 40 years and have been enjoying sailing and the culture of the Sea of Cortez since 2009 intermittently with work and other matters. All going well they will depart for French Polynesia in Spring 2019.